Astralis have been on a roll lately. After starting out the year with an uncharacteristically disastrous performance at the ELEAGUE Boston Major in January, they rallied to take first-place at just over half of all tournaments they’ve competed in so far this year. Another win at this weekend’s ESL Pro League Finals would help them cap off an already tremendous 2018 with not just another trophy but an additional $1 million for being the esport’s first Grand Slam Champions. While financial consultants love to tout the ever-growing potential of the esports market and companies with a stake in those projections love to tell fans that one of their favorite hobbies has finally arrived both commercially and culturally, esports continues to be huge mess. Most games don’t have single, unified leagues, and Counter-Strike definitely falls under that category. Most teams don’t have consistent salaries or the type of organized labor representation that might secure them, and, again, the CS scene struggles with that as well. Unlike Overwatch, which Blizzard has invested a lot more time and effort in professionalizing (read: making it look and operate more like traditional sports), Counter-Strike, a much older game with a much older community around it, is much more fragmented and ad hoc, its terrain cultivated by a bunch of different middle-men whose individual leagues and invitational tournaments don’t always overlap. That’s why we have the $1 million Grand Slam prize brought to competitive CS:GO by Intel, a company that makes computer chips, and tries to sell those computer chips in part by promoting PC gaming. In order to try and unify this esport somehow, Intel has thrown some money into the endeavor of connecting the disparate tournaments held by ESL and Dreamhack. Starting this year, the first team to win four trophies across any of the year’s 11 major events would become Grand Slam champions with a huge, by CS:GO standards, end-of-year bonus to attest to their greatness. 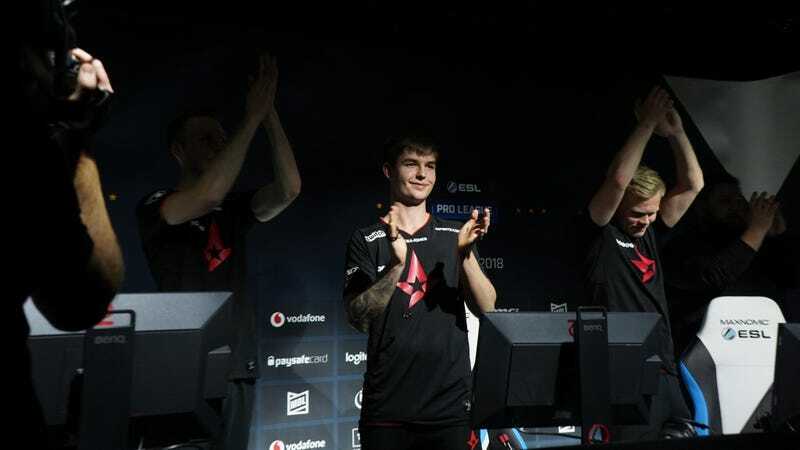 Now Astralis has a chance to be the first, currently with three trophies in hand and a very good chance of winning a fourth at this weekend’s Pro League Finals. Already seeded into the tournament semifinals, they’re currently set to face the winners of Mousesports vs. Renegades at 10:00 a.m. ET on Saturday. If they win that series, they’ll be headed to the Grand Final scheduled for the same time on Sunday morning, where they could potentially end up facing either Team Liquid, Natus Vincere, or Made in Brazil, the last of which has been bested by Astralis in every other recent meeting. The entire tournament is streaming live on ESL’s Counter-Strike Twitch channel. The year is winding down, and so are most of the other big esports. Still, the League of Legends All-Stars event is also going on this weekend. Matches resume tonight at 7:00 p.m. ET with AlelxelCapso vs. Captain Faker and will go into early Saturday, before starting again Saturday evening at the same time. The All-Stars finals, meanwhile, are scheduled for 12:20 a.m. Sunday morning. That event is streaming on Riot’s Twitch channel. Finally, collegiate Rocket League gets a moment in the spotlight with the National Championship on Saturday in Texas. The University of North Texas, University of Akron, University of Arizona, and Penn State will all be in attendance with $25,000 in scholarship money on the line in the four-way race. The broadcast starts on 12:00 p.m. on Rocket League’s Twitch channel.